Hey Disney, this is the steampunk princess movie we want! The last bit of animated steampunkery we saw from Disney was Atlantis: The Lost Empire. And sadly, most of the gadgets and steam-powered gizmos were quickly swapped for fluorescent face paint. Fortunately, we've spied the perfect bit of Disneyesque concept art that's a perfect starting place for a princess with plenty of technological know-how! 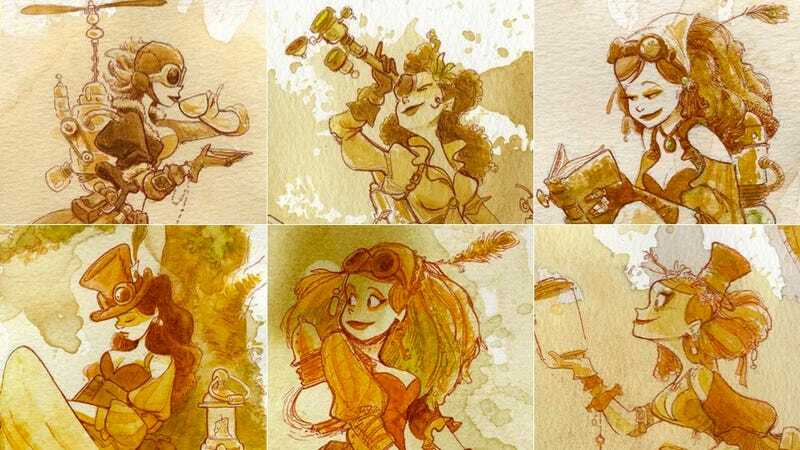 This series was drawn by Brian Kesinger (they're also available for purchase on his website). There's a reason these ladies look like they were born under a glistening Epcot ball. Kesinger is a story artist at Walt Disney animation studios, which only makes us want a lovely, octopus-walking princess all the more.